Barton Court+441242248177work Guest AccommodationOn the edge of the charming village of Colwall, Herefordshire, Barton Court is a Georgian country house set in 6 acres of beautiful grounds available to hire for short breaks, weekends, weddings and corporate events. The main house sleeps up to 24 in 10 bedrooms with 9 bathrooms. The setting is tranquil and uplifting with breathtaking views onto the surrounding countryside at every turn. The house and outbuildings have been undergoing a sympathetic and careful programme of restoration and we can now offer accommodation – in addition to the main house – in the Clock Tower [the honeymoon cottage and sleeps 2] and the Annexe [sleeps 4 and attached to the main house] - as well. We have a lot of weekend guests celebrating milestone events – anniversaries, big birthdays, annual reunions - or just taking the opportunity to gather together in a environment that is as welcoming as it as impressive. The Engine Room, once the slaughterhouse and, until recently, the home of a 1932 steam engine, has been repurposed and is now a glorious, light filled space, suitable for many different functions. The roller shutter doors have been replaced with glass to enhance its position overlooking the hills. Since its completion, we have hosted floral workshops, a pamper parties and business presentations. It is soon to stage cookery demonstrations, yoga classes and talks on foraging. The possibilities are endless. Adjacent to the Engine Room, is the Loose Box. This a fantastic bar created from the stables that were home to some of the family’s favourite horses. We have left it virtually untouched, just making it safe and warm and furnishing it in a style that enhances its inimitable character. The bar is open alongside the Engine Room for drinks and food and we are soon to be opening it on a daily basis for members of the public. 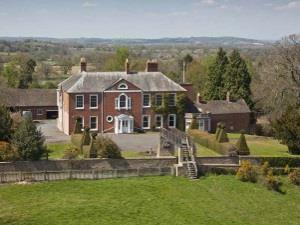 On the edge of the charming village of Colwall, Herefordshire, Barton Court is a Georgian country house set in 6 acres of beautiful grounds available to hire for short breaks, weekends, weddings and corporate events.